Anyone who wears prescription eyewear will tell you, the options for styles and colors have never been better! The fact that the glasses help you see clearly is almost an afterthought nowadays because the styles and the fashion statement that can be made with the glasses has come to the forefront. Prescription eyeglasses frames for girls are available in more styles and with more features than ever before. In the category of young people's eye wear, such as girl's eyeglasses, there are more colors, styles and options than ever before. Whether your daughter is a quiet scholar or an active tomboy, there are stylish and fun choices to fit any personality. 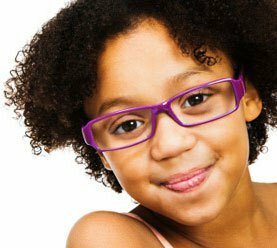 The biggest difference between the glasses worn by adults and the ones that are intended for children is the size of the frame. The girl's eyeglasses will be scaled to fit the child's anatomy more properly. The top designers are creating for all ages now, so the fashionable options exist for all age groups. The girl's eyeglasses styles will range from colorful and patterned plastic frames in all shapes of round, oval and rectangles, to the rainbow of colors offered in the wire frame category. There are price points at all levels in both sorts of frames and there are often price points that can allow for more than one pair to be purchased if the child wishes separate sports glasses or sunglasses as well. The lens type is a consideration that applies more to girl's eyeglasses than perhaps the adult category of eyewear. Plastic lenses are lighter and safer than glass and would be generally preferred for the younger wearer. There may be no need to consider things that are purely cosmetic, such as anti reflective coatings and polished lens edges since children are generally harder on their glasses than adults. They also tend to lose or damage them more frequently, so there may be a reason to purchase a second pair. Choosing girl's eyeglasses can be very enjoyable. They are now more like jewelry and a fashion accessory than at any time in the past and the range of colors and styles will delight even the fussiest female.